Summary of today’s show: Scot said he loves new stuff at the start of the show today – and as Catholics we have a double dose of new stuff these last few days. Yesterday not only marks the start of the new liturgical year, but the implementation of the New Roman Missal – a change in translation of our Mass parts – as well. Scot is joined today by Fr Brian Mahoney, Pastor of St Francis of Assisi parish in Dracut, Dr Edward Sri, Provost and professor of Scripture at the Augustine Institute, and regular Thursday co-host Susan Abbott to discuss all these new things, and analyze the changes that every Catholic heard and spoke at yesterday’s Mass. 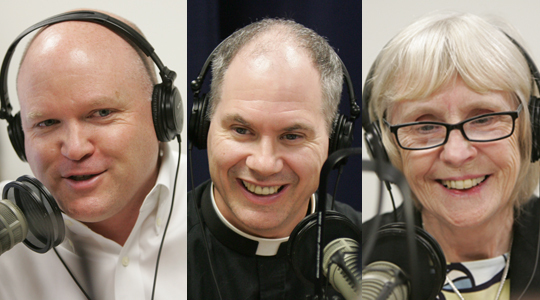 1st segment: Scot welcomed all the listeners back and welcomed today’s guests: Fr Brian Mahoney, Dr Edward Sri, and Susan Abbott. Scot asked Dr Sri what he thought the biggest changes to Catholics in the pews were with yesterday’s implementation of the New Roman Missal. Dr Sri said it was exciting for him – he went to the Saturday night evening Mass to hear it first. His Church in Denver provided both pew cards and a screen for people to follow along with the new words and responses. As much as he had prepared for it, Dr Sri said he stumbled a few times, even messed up the second reply of “And with your spirit!” (leading to much teasing from his kids). He continued and said that the biggest change was the Creed, but he was pleasantly surprised to hear people following along well and not stumbling too often. Dr Sri said it will probably take a while before we instinctively say “And with your spirit” as a response, but it will happen eventually. Susan shared that at St Theresa’s in West Roxbury the Sunday morning Mass at 10:30, the pastor encouraged people to follow along on the pew cards or in their missalette – everyone had something in their hands to keep themselves on the same page. Scot reflected that he and Fr Brian had only known the “old” translation that we used up until last week, and how interesting it was to hear a new one. Fr Brian commented that he thought things went very well at his parish. He attended all the Masses to conclude a series on the new missal that he has been running in the parish for the last few weeks. Everyone at Sunday Mass was saying “And with your spirit,” but at daily Mass this morning it seemed some people forgot! Scot commented that many Catholics seem to remember those few little words the most. Dr Sri explained that he views the Latin text of the Mass as a great carrier of our Tradition, and the English reflection of that Latin should do the same. In this case, “and with your spirit” is reflecting the words of St Paul in his letters, but also the significance of the history of the exchange. In the past, Dr Sri said, people said “The Lord be with you” as an invocation of power or to empower people who needed God’s help – Moses, Joshua, Gideon, even Mary heard these words. Now when we hear them in the Mass, Dr Sri continued, we should remember that we are called to do something daunting that we couldn’t do on our own – encounter God in his Word and in the Eucharist. When the priest says “The Lord be with you,” he’s almost saying “get ready!” In the same vein, “And also with you” is not supposed to be a “right back at you, Father” response, but rather asking God to bless the identity of the priest – the spirit changed by Ordination that enables him to offer the Mass. When we say “And with your spirit,” we are asking God to come upon the priest’s spirit as he offers the sacrifice of the Mass. Scot read a quote from Cardinal Burke that said the new prayers were more beautiful and might encourage more Catholics to think about what they are praying. Scot asked Fr Brian which of the new prayers he finds the most beautiful. Fr Brian said the way many of the opening prayers have been re-written express a richer texture that offers more to reflect on. Fr Brian continued and said that his favorite new piece was in Eucharistic Prayer III after the Holy Holy, that we recapture Scripture where the priest says “from the rising of the sun to it’s setting” – a direct reference to Malachi. Susan commented that her favorite new change is the lineLord I am not worthy that you should enter under my roof, but only say the word and my soul shall be healed,” which was contained in this morning’s Gospel as well. Fr Brian commented that in the old St Joseph Missal for the Tridentine Mass translates the line the exact same way. Susan continued and said that people who grew up with that Missal or have been away from the Church for a very long time may see some familiar text in the new translation. Scot asked Dr Sri what elements he found most beautiful in the new translation. Dr Sri replied that one of his personal favorites is when the priest holds up the Host and used to say “Blessed are those who are called to His supper,” but now says “Blessed are those who are called to the Supper of the Lamb.” Dr Sri said he loves it because of the Biblical background of the prayer, which is much of what his work entails – that line is almost a direct quote from Revelation 19:9 where St John has the vision of the Heavenly Liturgy. Scot asked Dr Sri what he thought the best resources to learn more and appreciate more what we pray throughout the liturgy. Dr Sri replied that his book and website are one, and the USCCB’s website is a great resource as well. This is a great moment, he continued, to catechize on the Mass like never before. The change in translation will make people more open to learning about what we believe and what the Mass is really all about – and we can easily do this by focusing on the prayers. Dr Sri said that at his presentations around the country he’s been surprised by the happiness of Catholics to learn about what the prayers mean and why they’re worded the way they are instead of just going through the motions of a Mass. Susan said the Archdiocese has a great website dedicated to the topic, and LifeTeen produced videos aimed at teens as well. Scot noted it’s interesting how people process the changes – having followed the changes for the last few months he said he expected people who weren’t as in tune with the changes to be asking about the new words. He said that in his subset two things were mentioned the most – the praying of “I believe” instead of “We believe” in the Creed, and saying “the chalice of my blood” instead of “the cup of my blood.” Dr Sri and Fr Brian noted that the “I believe” is a long tradition that emphasizes personal belief before the communal belief. The word chalice emphasizes the reverence we have for Jesus’ blood made present on the altar. 2nd segment: Fr Brian went back to the “I believe” opening to the creed, and explained it was originally a “heretic detector” of sorts. People who believed in various heresies that conflicted with the creed would refuse to say it – it was how the community at the time knew they needed to counsel and pray with some of their members and whether or not they were in communion with the Church teachings. Fr Brian said that the “I” is still appropriate because as individuals we speak the truth of the Church as both yourself and the singular, unified voice of the Church as well. Fr Brian said it felt odd to pray the new prayers in one sense – he had the old Eucharistic prayers memorized. Having a prayer that isn’t completely changed can be tricky, and falling into the old pattern was difficult sometimes. Even though he had studied all the prayers before this weekend, Fr Brian said he still forgot the blessing for the deacon before proclaiming the Gospel and had to fall back on the old one. He said with all of this, it’ll take some time to get used to the new flow. Susan commented that Msgr Dennis Sheehan said in a presentation to the Pastoral Center staff last month that the priests have a lot of changes to deal with and will need some time and prayer to adjust. Fr Brian said that overall, the new language is much more poetic, but may feel odd to people at first because it’s not language we’re used to hearing, thinking, or speaking in every day. It’s not necessarily an obstacle, he continued, but a challenge for people to overcome. Susan said that the translation is a good “teachable moment” -for example, anyone can be born, but only Jesus could be incarnate of the Holy Spirit. Fr Brian discussed that, in reality, Christmas is a celebration of the revelation or manifestation of the Incarnation, which we celebrate on March 25th with the Annunciation – Jesus was fully human and fully divine from the time he was first in Mary’s womb, not just when he was born on Christmas day. Fr Brian said that a good way that he is preparing to use the new texts is to pray over them every day – something he did in the past with the daily prayers and readings, but will now expand to include some of the other prayers the priest says in the new translation. The big part, Fr Brian said, is that he knows what it’s about – none of it is theologically new, just semantically new. He said he trusts the Spirit to help him and his congregation to be patient when he messes up. We all have to be patient with ourselves and the community, Fr Brian said, and be comfortable with being uncomfortable for a bit while we all adjust. Susan said that while we may not be as comfortable with the new texts in the next few years as we have gotten with the old texts, it will eventually happen with time and patience. People will catch on pretty quickly, she said. Scot said one of the last changes he noticed was a simple word change – “the fountain of all holiness” in the old translation, and “the fount of all holiness” in the new. Scot continued and said that it is a great example of how the new text teaches the faith. A fountain showers on you, all you have to do is get near it and you’ll get wet, and you can be very passive. God as a fount of holiness reminds us that we have to actively seek out the source of holiness to experience his blessing. Old Version: Look with favor on your Church’s offering, and see the Victim whose death has reconciled us to yourself. Grant that we, who are nourished by his body and blood, may be filled with his Holy Spirit, and become one body, one spirit in Christ. New version: Look, we pray, upon the oblation of your Church, and, recognizing the sacrificial Victim by whose death you willed to reconcile us to yourself, grant that we, who are nourished by the Body and Blood of your Son and filled with his Holy Spirit, may become one body, one spirit in Christ. This small tweaking unites us even more closely to the sacrificial element of the Mass, Fr Brian said – something that was always there, but is more prevalent in the new translation than before. Susan concluded by saying that she loved the options for the dismissal rite – “Go and announce the Gospel of the Lord” or “Go in peace, glorifying the Lord by your life.” She said that she hopes our priests will take these two powerful dismissals as an option.